When a man who appears mentally unstable holds a group of people hostage and dies in a shootout with the FBI, Special Agent Lucy Kincaid is assigned to investigate what happened. Up until two months ago, McMahon wasa respected scientist—then his wife left him, he lost his job, and he was arrested for assaulting a former colleague. The one person who might have answers—his research assistant—has disappeared. While Lucy is investigating this bizarre case, her husband Sean is on top of the world: his son Jesse is visiting for the summer. They are having a blast, until someone follows them. Sean is positive that the surveillance is connected to Jesse’s step-father—a man who had once laundered money for a violent drug cartel. But when Lucy and Jesse are run off the road, they begin to wonder if the attack is connected to Jesse…or Lucy’s current case. Not great literature but action filled . Characters not well developed and plot a bit contrived. In this compelling fourteenth installment in the Lucy Kincaid series, Too Far Gone, Brennan has written an intricate, action-packed, police procedural that has FBI Agent Lucy Kincaid and her fellow law enforcement colleagues delving into a case that on the surface seems to be a simple hostage situation but which quickly unfolds into a complex case involving a suspicious death, a missing assistant, and a pharmaceutical company with something to hide. The writing is taut and precise. The characters are rugged, intelligent, and relentless. And the two main plots intertwine and unravel into a seamless, entertaining tale full of deception, secrets, corruption, scandal, cover-ups, manipulation, family drama, jealousy, violence, and murder. 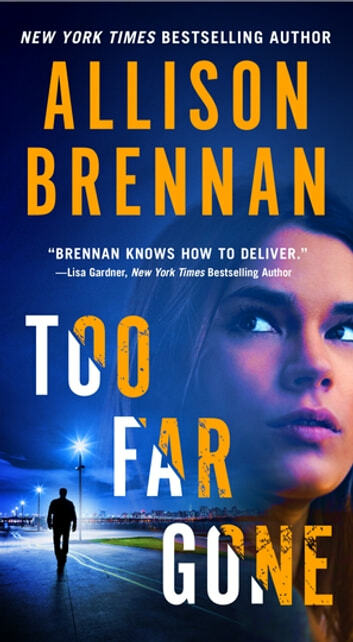 Overall, Too Far Gone is a multi-layered, captivating mystery that highlights that money and greed are often the root of all evil. And even though it's another wonderful addition to the series that fans are sure to appreciate it can also be read and enjoyed as a standalone novel. Another riveting addition to the Lucy Kincaid series. I love this series and author. There's an urgency to the story which makes it hard to but down; the mystery/crime is captivating with many players. But the center of the story is really about family and finding our place.